What is it with America and chicken wings? 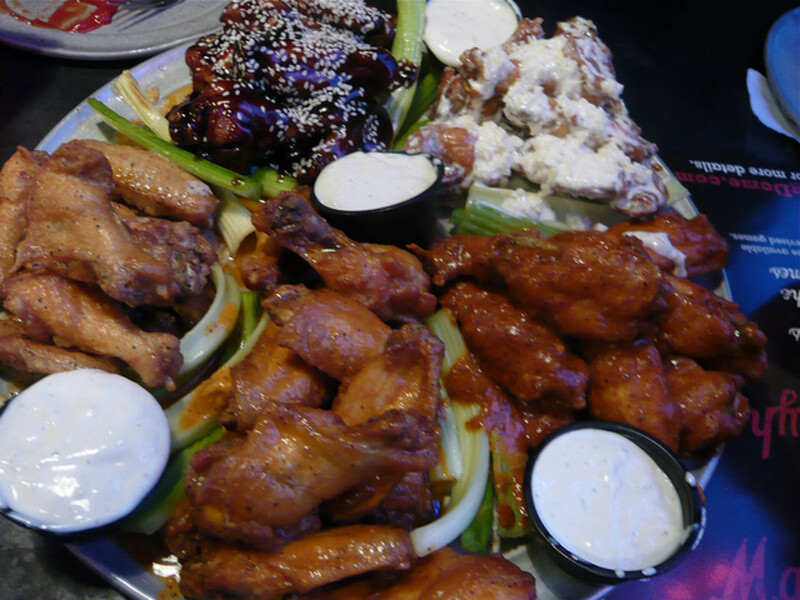 Practically every restaurant in the United States now offers hot wings as appetizers, and many of the fast food chains and pizza joints have even gotten in on the action. The wing craze really perplexed my dad. He used to own a grocery store with a meat section, and he could hardly give chicken wings away back in the sixties. 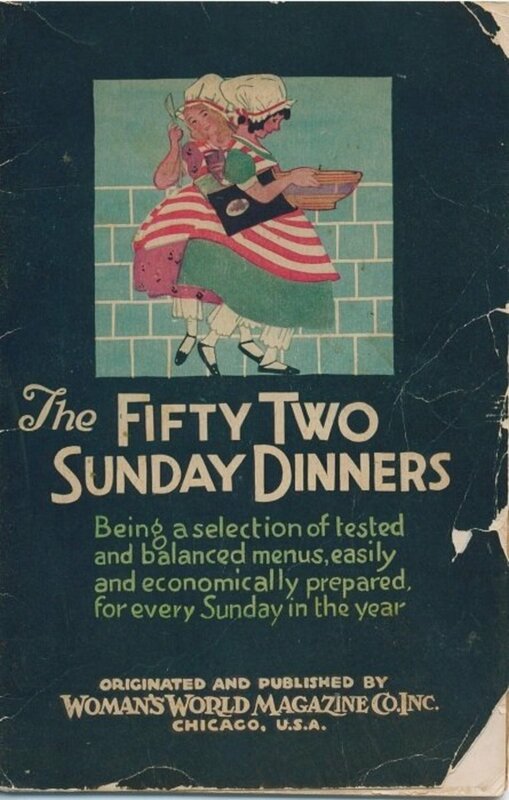 I suppose the craze started with the famous Buffalo wings, and I guess we folks down South were sort of slow in catching on. Catch on, we did, however – big time! Wings are super popular here now. You can hardly attend a party or a cookout without being offered the yummy morsels. 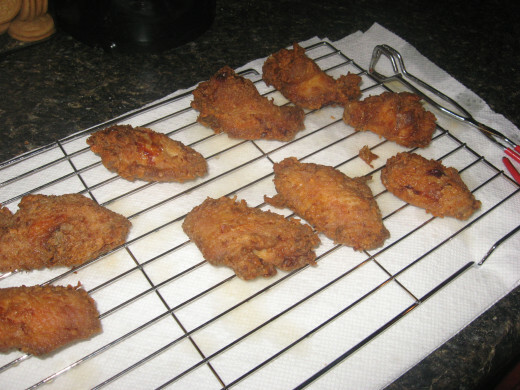 In fact, I have lots of chicken wing recipes and use them quite often. Two of my grandsons can go through a batch in no time! Sometimes I’m convinced those little guys could eat their weight in hot wings. At a typical outdoor barbecue, it’s pretty common to be given some wings to munch on as the pork butts and ribs are smoking. Actually, I’ve been cooking up some wings today. Hubby brought home a big bag of them, and I’ve come up with three new chicken wing recipes that I think you’ll like. I guess all could be classified as Thai chicken wings, or as peek gai nam daeng, more or less. There are more chicken wings recipes than you can shake a (drum)stick at! It seems that everyone has his favorite. Of course, many prefer hot wings that are similar to the traditional Buffalo wings. I like those, but I usually prefer more of a sweet heat, so I often add sugar, brown sugar, or honey to my wings or to my wing sauce. 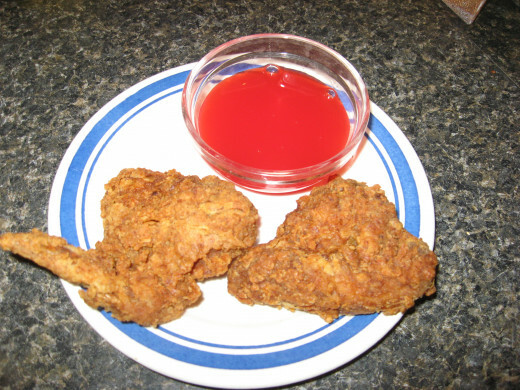 Another sweetener you can use on your wings and in your wing sauce recipes is jelly. Jam works well, too. My favorites include pineapple, orange, apricot, mango, and peach jelly, jam, or marmalade. Coming up with your own chicken wing recipes is super easy. You can make a wing marinade, or cook your wings without one. 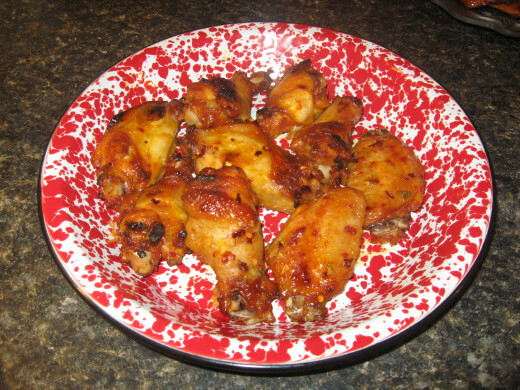 Wings can be coated with dry or wet seasonings and baked in the oven or grilled. Fried wings are pretty quick and easy, too. Just shake the wings in seasoned flour and fry in hot oil. 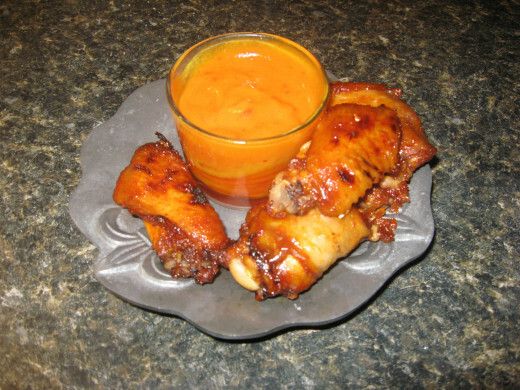 No matter how you cook chicken wings, you can make them as hot, as spicy, as mild, as savory, or as sweet as you want. Herbs, spices, dry ranch dressing mix, bottled Italian dressing, Cajun seasoning blends, Worcestershire sauce, teriyaki sauce, soy sauce, and barbecue sauce can all be used to create some tasty wings. For classic Buffalo wings, use melted butter and hot sauce. I like Thai food, but keep in mind that I’ve never been to Thailand, nor do I have any friends or acquaintances from Thailand. Well, I do have a nephew from Cambodia, which is next door. Does that count? The only Thai food I’ve eaten was prepared in U.S. restaurants, so I have no idea if I’m getting “real” Thai food or an Americanized version of it. 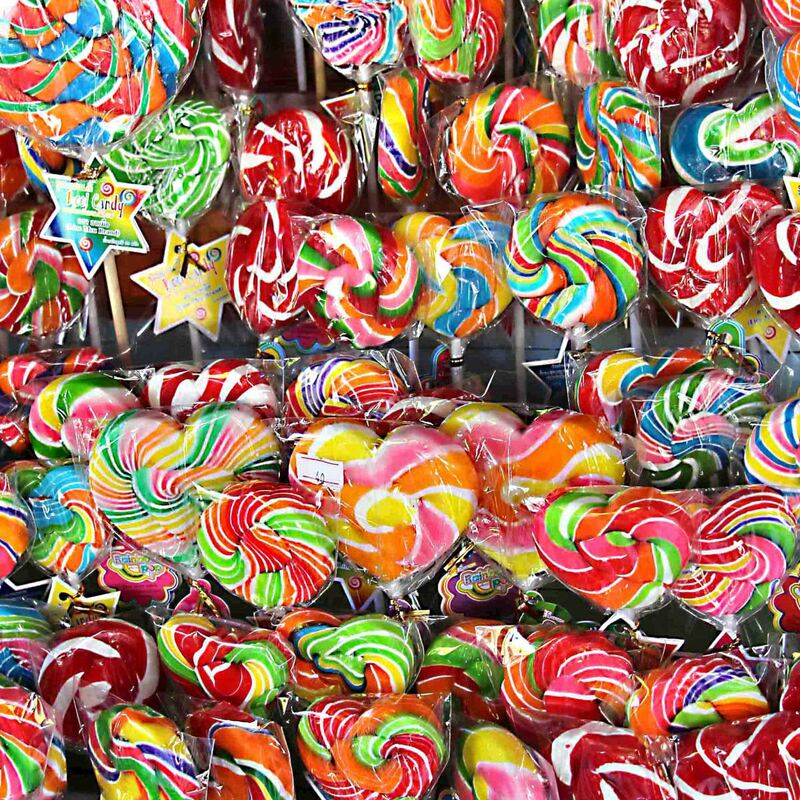 Either way, some of the flavor combinations are right up my taste bud alley. I think it’s that combination of sweet, sour, salty, and hot that can be found in so many Thai foods that appeals to me. 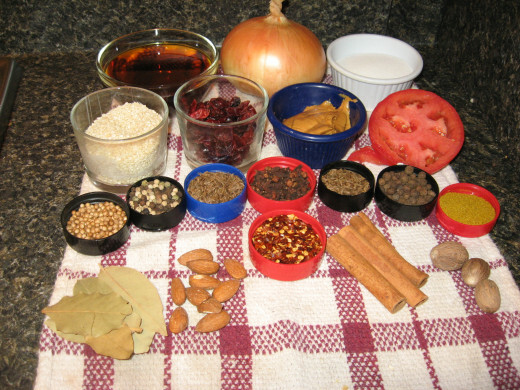 I use a lot of herbs and spices in my cooking, and the ones used in many Thai foods are appealing to me. These include lemon grass, curry, cumin, chili paste, basil, cinnamon, cloves, mint, tamarind, ginger, bay, nutmeg, and cardamom. Some of my favorite Thai ingredients are shrimp, coconut milk, chili peppers, shallots, garlic, asparagus, fried noodles, mango, rice, sesame seeds, pumpkin, soy sauce, bamboo shoots, pineapple, and limes. Surprisingly, some of my southern favorites are also used frequently in Thai cuisine, including sweet potatoes, mustard greens, and cucumbers. I don’t like all Thai dishes, like the ones made with the blood from pigs and cows or the ones that include squid. I’m not much for pig trotters or pig intestines, either. My favorite Thai foods are khao kha mu, tom yam kung, tom yam nam khon, kiao kung, phat wun sen, pla sam rot, and phunim phat pong kari. Fairly recently, I’ve become acquainted with Thai BBQ chicken wings, and I’ve been making them in my own kitchen. Below, I’m going to share three recipes for chicken wings, all with Thai influences. These Thai BBQ chicken wings are awesome! They’re sweet and sticky, with a little heat, and the lime juice gives them a bright kick. You won’t need any dipping sauce for these puppies, but you will need several napkins! Rinse wings and pat dry. Remove any pin feathers, if needed. 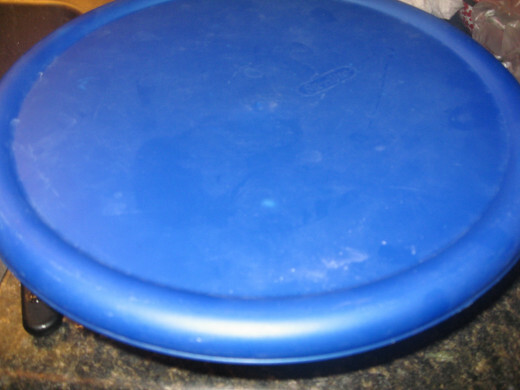 Place wings in a large Ziploc bag or a bowl with a lid. Combine remaining ingredients and pour over wings. Toss to coat. Marinate wings in the fridge for two hours. 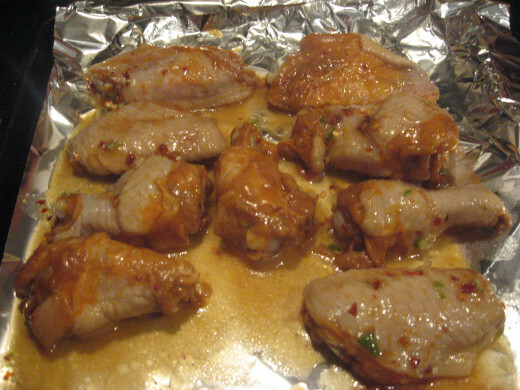 Remove wings from marinade and place on a baking sheet lined with foil. Cook for about 25 minutes, then turn on broiler unit to brown. These spicy chicken wings can be baked in the oven or cooked on the grill. For grilled chicken wings, set the grill to medium-high and cook the wings for about five or six minutes on each side. 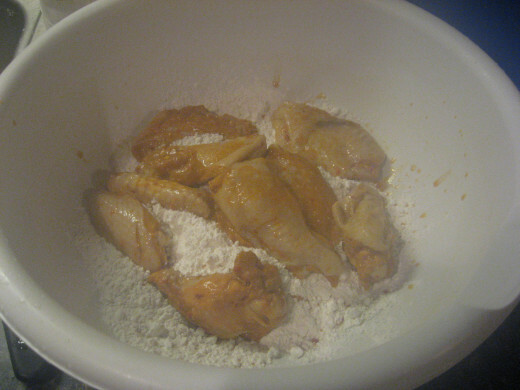 For baked chicken wings, the directions can be found below. I turn the heat up when the wings are almost done to get them nice and brown. Directions: Rinse and dry wings and place in plastic food bag. 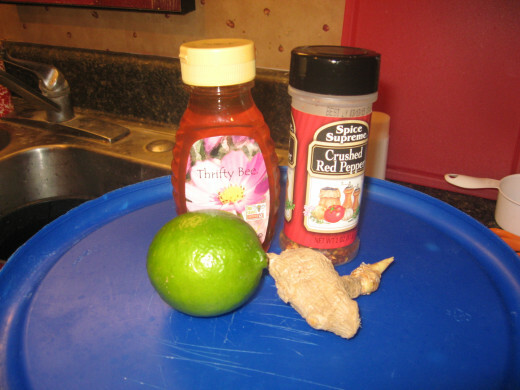 Combine next ten ingredients to make chicken marinade. Cover wings with marinade and refrigerate for two to four hours. Remove wings from marinade and arrange on foil-lined baking sheet. To make the mango dipping sauce, combine mango jelly, mustard, lime juice, and garlic. Microwave until jelly becomes soft and liquid. 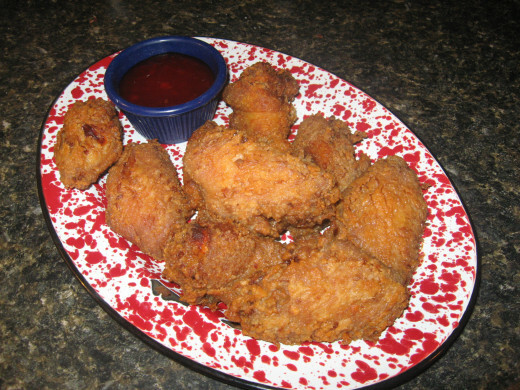 This is a deep fried chicken wings recipe that we really like. 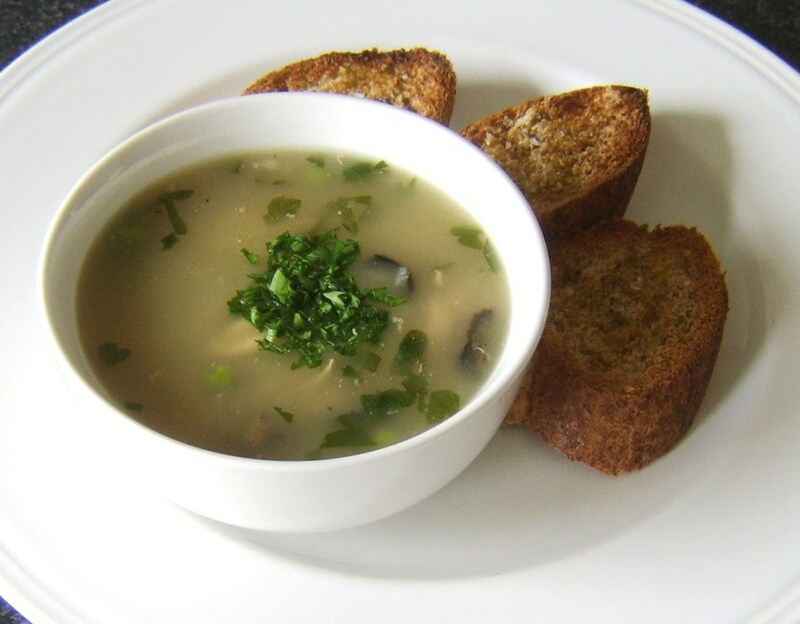 For more authentic Thai cooking, use rice flour instead of regular wheat flour. Smaller pieces will fry up better, with a crispier texture. You can use whole wings if you like, but I think you’ll like the results better if you use wing sections. Also, to keep the wings crispy, drain them on wire racks over paper towels. Directions: Rinse wings and pat dry. Place wings in a plastic bag or bowl. Combine lime juice, soy sauce, rice vinegar, sugar, and garlic. Stir until sugar dissolves, then pour mixture over chicken. Marinate in the refrigerator for one to two hours. Combine flour, ground ginger, curry powder, salt, and pepper. 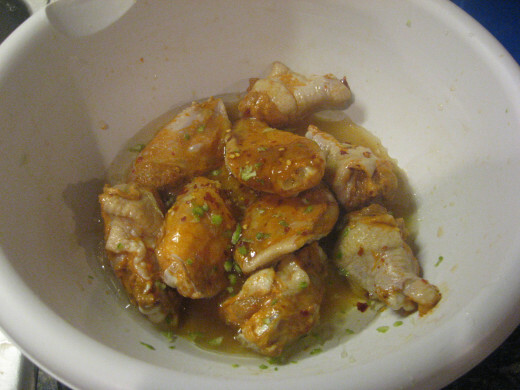 Remove wings from chicken marinade and blot dry. Dredge in flour mixture. 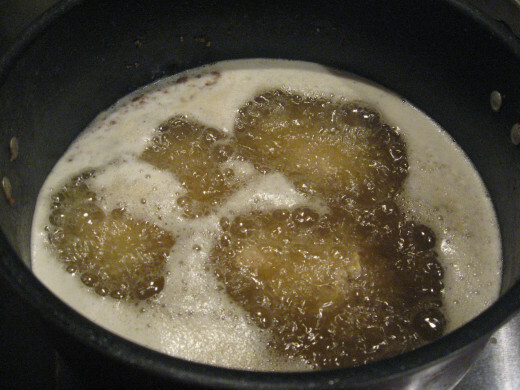 Fry wings in two or three inches of oil, heated to 360-370 degrees. Cook in small batches until wings are brown and crisp. Drain fried wings on wire racks. Serve with your favorite Thai-inspired dipping sauce. Thanks, Carol. I hope 2013 brings you many blessings! As much as I love wings I have never made them. YOu have some super ideas here for all kinds of different tastes. So..voting up and pinning ...and You have a wonderful New Year. MH, so do we! Hope you have a wonderful day. Thank you for these. Love those wings.